Over the past year and a half we have seen the actress Lupita Nyong’o rise as one of the most popular and talented actresses in many years. She has starred next to seasoned veterans like Brad Pitt, Liam Neeson, and a plethora of others. Her talent has captured the hearts of many, but even better is her personality. Always humble, always smiling and gracious, you cannot help but see the light in her as a person. All of that talent and charisma is topped off by her amazing stylist Micaela Erlanger, who also styles Oliva Munn, Common, and Winona Rider. 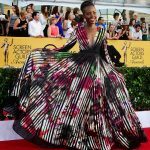 It seems Lupita cannot miss with Ms. Erlanger at her side guiding her in the direction of the most glamorous, unique, colorful and jaw-dropping gowns. Below are some of our favorite looks from the actress styled by Micaela Erlanger.